If any of you are friends with Dave on Facebook, you know that he just posted a quick goodbye. His plan was to go through customs in Nuevo Vallarta today and then sail over to Punta Mita for the night before taking off tomorrow or maybe Saturday at the latest. I just wanted to let everyone know that I’ve updated our links column over on the right (——–>>>>) to include the ShipTrak.org. The link should take you directly to our call sign page (Call sign is KE6GKT) and this will let you know where Dave is on his journey across the Pacific. Of course, we haven’t updated it since the beginning of April when we were coming back from Manzanillo…but if Dave remembers to plug in his coordinates every day or so (using Sailmail/SSB radio), then we should get a pretty good idea of how his trip is going. All’s well in the San Francisco Bay Area. My days are now spent working and commuting. My tan has faded and I’m constantly cold. I still crave street tacos and I’m not sure that’s ever going to change. Here’s a photo that I forgot to post when we got home. It’s my “Hasta Luego” moment with Camanoe. 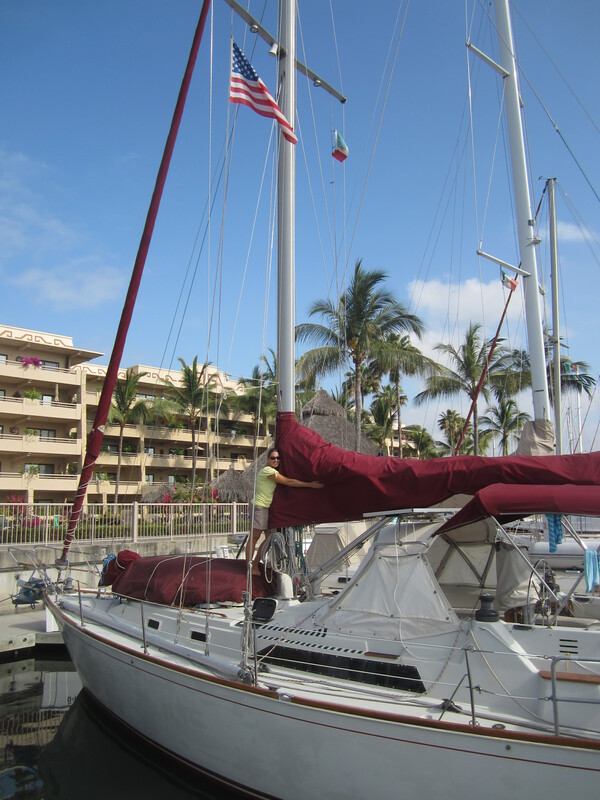 This entry was posted in Hawaii, Pacific Mexico and tagged Capt's Log, Hawaii by SME. Bookmark the permalink. I love that pic of you Stephanie, it is so darn cute just like you! It made me smile and laugh out loud. Miss you guys! Hugs! Safe travels to Dave and a good commute to you!